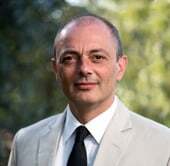 In this guest column, Antony Giorgione reveals 10 ways that behavioural sciences and marketing can be used to guide us to make choices both expected and unexpected. “Labels matter, and the mislabelling of applied behavioural sciences as behavioural economics has consequences”, said Daniel Kahneman on the subject for which he won a Nobel Prize. The term ‘behavioural economics’ has come to be associated with a seemingly counter-intuitive understanding and application of psychology into diverse disciplines for improved efficiencies. It presently embodies a range of labels: behaviourally-informed intervention, marketing sciences, law and emotion, prospect theory, homo reciprocans, nudging, freakonomics, predictable irrationality, lateral thinking, and so on. In an attempt to convey this broad church, here it is interpreted through 10 things. You are likely to experience an emotional impact twice as strong when losing $100 than when winning $100. An illustration of loss aversion – a component of prospect theory by Kahneman and Amos Tversky. This risk-assessment theory forms the basis for behavioural economics and serves as an introduction to such concepts as the sunk-cost effect, status quo bias, reference dependence, the dominance principle and framing effects. One category of framing effect is choice architecture. A study by Sheena Iyengar and Mark Lepper found 30% of subjects bought a jar of jam after being given a choice of six jams, but only 3% of people bought when presented with 24 options. Too much choice might actually inhibit decision-making. You are given a candle, a matchbook and a box of nails and you are asked to attach the candle to the wall in a way that it wouldn’t drip wax on the table beneath. 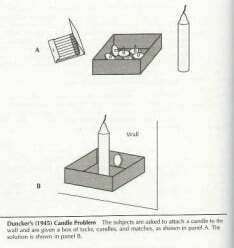 An experiment which resulted in most people trying to nail the candle to the wall or stick it to the wall using molten wax. Far fewer emptied the box of nails, nailed the box to the wall then set the candle upright within the box. An example of Karl Duncker’s functional fixedness theory – that we have a tendency to generate solutions to problems from within a fixed set of perceptions or schemas. One of Edward de Bono’s Six Hats: an influential tool that tries to circumvent functionally-fixed problem solving with tangential thinking prompts. Thinking beyond the obvious. Counter-intuitive thinking. Lateral thinking. The advertising creative is valued for their capacity to think outside a functionally-fixed response to a brief. This ‘applied creative’ skillset is mostly directed towards maintaining or shifting brand preference, but it can also be used to elicit behaviour change – such as Droga5’s idea of putting a mobile phone into the hands of less privileged children as a tool to improve learning habits. An image of a fly etched on to a urinal at an airport resulted in an 80% reduction in spillage – the result of men aiming at the fly when urinating. 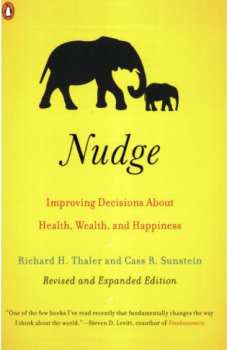 This example is from ‘Nudge’ by Cass Sunstein and Richard Thaler, an easy-to-read treatise on ways to improve public policy and services through a deliberative application of framing and other aspects of the behavioural sciences. The Behavioural Insights Team is an adjunct to the Cameron Government in the UK that applies the thinking and methodologies of nudging. BIT’s redesign of a prescription chart included a ‘please circle’ option to discern between ‘milligram’ and ‘microgram’ measures. Error rates were significantly reduced when compared with the previous practice of having the clinician write out these two similar-looking words in their traditionally inscrutable handwriting. At the beginning of her second trimester, an expecting mother might find herself particularly sensitive to smell and start buying scentless lotions. Something Target Stores in the US discovered when developing predictive analytics to drive traffic into their post-natal department. From the extraordinarily revealing case study by Charles Duhigg in the New York Times featuring the pregnant teenager and the irate, then contrite, dad. A re-labelling initiative of the Rapeseed Association of Canada. There is no Nobel Prize for psychology. Though Kahneman is a psychologist, he won his Nobel in the category of Economic Sciences. Behavioural economics exists in counterpoint to prior economic theories predicated upon an assumption of the purely ‘rational’ person-unit. But this behaviourally-distinct theory of economics has also come to be perceived as a new metric of psychology; a redefined economy of behaviours. And part of this perception is due to a label that can be interpreted in more ways than one. Would be interested to hear about your thoughts on this issue. I’m trying to choose my language carefully with my articles; none of this stuff is necessarily ‘universal’ or applicable across all contexts. Having said that, I still believe there is some truth to the idea that too much choice inhibits decision-making – from my own experience, giving some clients too many creative options is one example that comes to mind. Perhaps the shift in the power dynamic between brands and the major supermarkets might be another (albeit with other significant factors also in play). BTW, that is a fantastic article. Many thanks for the link. I would agree with paragraph 5 from commenter Jason Le Nestour in this specific case. Thanks Ashton. Appreciate your kind compliments. Sometimes I wake up screaming. How does your article relate to this?